For those of you who chose to wallpaper their rooms, with your walls all prepped, ceiling painted and all woodwork glossed (see HOME DECORATING Part 1) you are now ready to wallpaper. With wallpaper, there are a few things to bear in mind even before you choose your paper. For instance many patterned papers have a repeat in the pattern which ranges from between 6 inches up to a huge 30 inches. Obviously the larger the repeat the less lengths of paper you will get out of a roll. A paper with a repeat of 18 inches will generally give you 3 drops of paper on an eight foot high wall and as most papers come in a width of around 21 inches, we now have a means of estimating how many rolls of paper we would require to decorate a room. Say for example that your room was 10 foot x 8 foot. That would give us 2 walls at 120 inches width and 2 walls at 96 inches. So 120 + 120 + 96 + 96 = 432 inches in total. Divide that by the width of a roll = 20.57 or 21 roll widths. Then if we get 3 drops to a roll our 21 widths would equal 21 divided by 3 = 7 rolls required. Knowing now what our requirements are it must be stressed that it is always best to get all you need in one go and to be extra safe, maybe an extra roll too. It is always better to get this in one go because all wallpapers are printed in batches and sometimes colour differences occur between different batches. It is for this reason that wallpaper is packed with a batch number on the wrapper. When you buy your paper, ensure these batch numbers are all the same. So anyway, now we have got our wallpaper let’s get it hung and for that we will need wallpaper paste. Although Solvite is the market leader in this field, you might find that many decorators steer clear of it. This is because despite of its adhesion qualities, when hanging the paper any paste residues between adjacent drops tend to leave a shiny finish on the paper (flashing). For that reason alone we would recommend LAP wallpaper adhesive which whilst being readily available is a little harder to find in the DIY sheds. Most people when papering would generally cut a length and hang it immediately and then go onto the next length. A decorator does it somewhat differently. Without the need for measures, he would take his first roll and roll it out down the wall giving himself probably 5 or 6 inches spare. He will cut this drop to length plus his excess and lay it flat on his paste table leaving a big fold in the middle so that both ends would remain fully supported by the table. Next he would roll out his next length adjacent to the first at the same time matching the pattern and by doing so he knows where to cut the paper with enough length to cover the wall with the pattern correctly joined. Repeating the procedure through the whole of the paper, he now has even lengths of paper to finish the job. With all his paper cut into lengths, our decorator lays all the paper, pattern side down on his paste bench and proceeds to paste 4 or five sheets. This gives the paste time to soak into the paper which in turn makes the paper a little more workable. The decorator will also pay more attention to the paper edges while pasting because it is generally at the seams that the paper will later lift. Now with 5 sheets of pasted paper at the ready our decorator will paste the wall slightly wider than the roll width, where he wants to lay his first drop. He will then roughly lay the paper out onto the wall and check that it is running true with a plumb line running down the side of it. If the paper isn’t true, he will slide it on the wall (the reason for pasting the wall) until it is perfect when he will proceed to properly hang the paper by brushing it level and then it’s time for drop number two. Now because the wall was pasted wider than the width of the first piece of paper there should be enough spare paste on the wall for our boy to slide his next piece into position and when it’s there he flats it out fully and runs his paste brush up behind the edge where the next sheet will go and flats it out again. Can you see what he’s doing? He has prepared the way forward for his next drop by pasting that edge as whilst doing it, he was also lubricating the wall for the next drop to be slid into place on. This process is repeated for the full five drops that he had pre-pasted and when he has all five lengths hung, he returns to the first length to trim the tops and bottoms of the paper giving it a proper fit between the pre painted ceiling and skirtings. After trimming all five lengths he is ready to go again with another five lengths. And by doing it this way he has minimised the use of ladders, brushes and scissors in a less stop, start, stop, start manner. He has double pasted all his paper edges ensuring a better adhesion and has not had the need to mark either the walls or the paper to hang it, minimising any potential black lines. But above all else, he has saved time. So that’s the way to do it, but there are a couple of other things worth noting before we begin which are: We walk into a room through the doorway and that is generally how we view the room. From the doorway, within. With this in mind, and the fact that our enemy broad daylight usually enters the room from the opposite direction, our decorator accounts for this by working in an order to counter any adverse effects this may cause. He will start near the window side of the room and paper back towards the doorway to minimise the shadows caused by any overlapping in his papers. He will also work his way round a room so that any mismatch in the paper hanging will occur in the corner above the door where it is less likely to be noticed. Or in a corner of a bay window where he knows that some form of furniture will conceal it. Another thing worthy of note is that the professional decorator will always cut his paper into an internal corner and use the off-cut to continue his perfectly matched paper round the corner. He does this because he knows that no walls on this planet are perfectly true and to just spread his paper around a corner will almost always lead to the leading edge for the next drop will be shaped like a banana, as will the next and the next and the next etc. Likewise, an external corner can do the same so when papering around a chimney breast, our decorator with cover the front first and minimise the margin for error by making his adjustments on the reveals where they can be brought back inline before the next major drop. 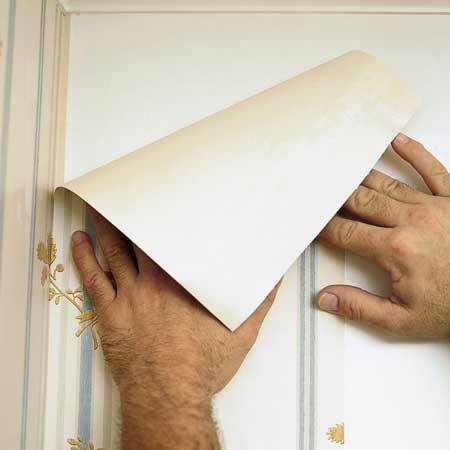 When working with heavy duty papers, it is better to paste the walls as well as the paper. It is worthy of note that some of these heavier papers are prone to shrinkage across the width when they are dry. With this in mind some decorators would consider painting the walls a similar colour as the paper prior to hanging it so if the paper should shrink, leaving a slight gap between drops, at least these gaps would not be so noticeable. But the best and proper way to tackle this would be to hang only one or two drops a day, replacing any offending drops as required. The only other thing to consider is your choice of pattern. Any walls you intend to paper that are not perfectly flat should avoid linear or stripy patterns as they will only exaggerate these pre-existing flaws.